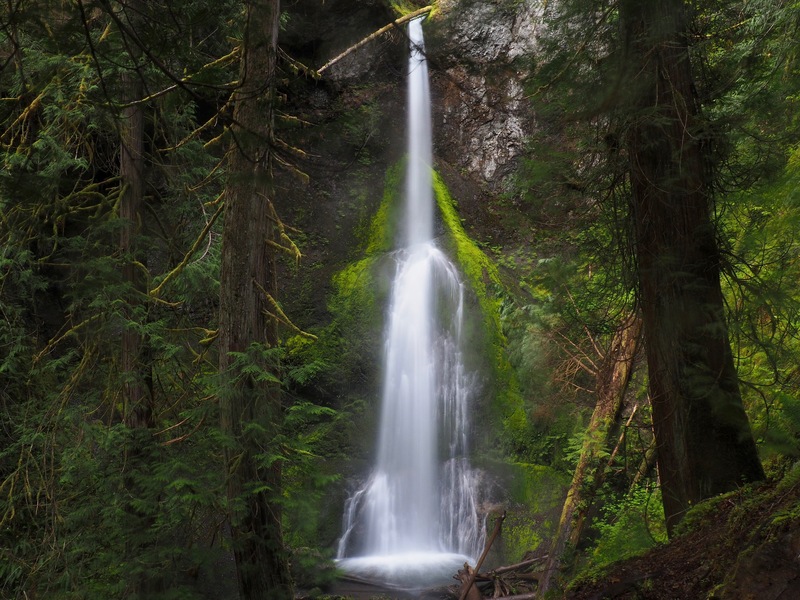 Marymere Falls is the highlight of the trail, quietly plunging approximately 119 feet/36.30 meters into a shady forest amphitheatre. Marymere Falls Nature Trail, May 20, 2017. 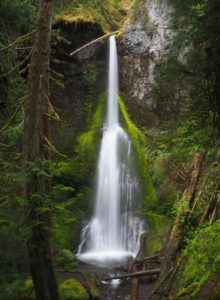 The Marymere Falls and Barnes Creek trails are technically two end-to-end trails but, given that they function as a single trail along Barnes Creek with a short but charming side jaunt up Falls Creek to Marymere Falls, they are both profiled here as one. The trail tracks Barnes Creek for over two miles/3.20 km, alternating between draping deciduous forest alongside the creek and dim conifer stands cloaking the undulating flanks of Happy Lake Ridge before leaving the chattering waters behind as it climbs to its quiet forest junction with the little maintained Upper Barnes Creek Trail and the Aurora Divide Trail (on some maps marked as the Barnes Creek Primitive Trail). Few mountain views open through the lush canopy of mixed forest arching into the narrow valleys and folds. 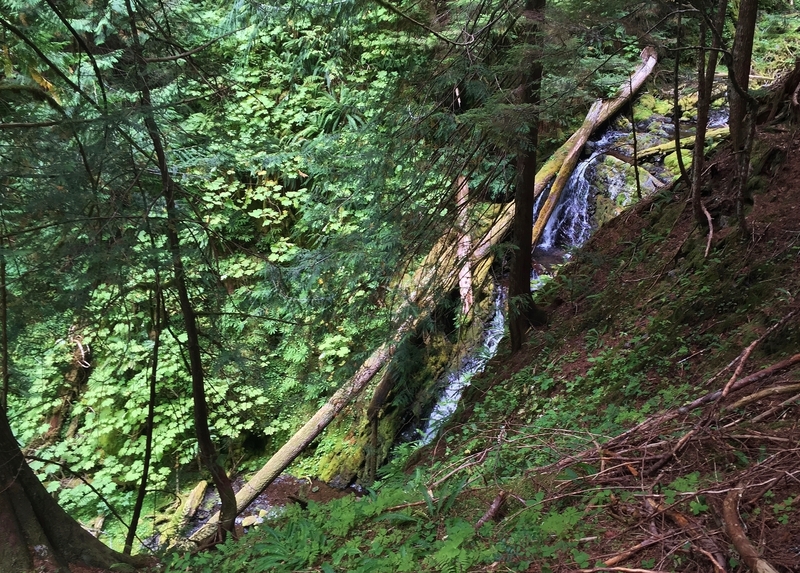 Hike this trail for the lonely forest solitude — few others venture beyond Marymere Falls. The trail is flat until it reaches the Marymere Falls Nature Trail/Barnes Creek Trail junction. The nature trail to Marymere Falls crosses a footbridge and then climbs (and descends) the short Falls Loop steeply in both directions. Beyond the junction, the Barnes Creek Trail’s rolling incline is gentle, but consistent. 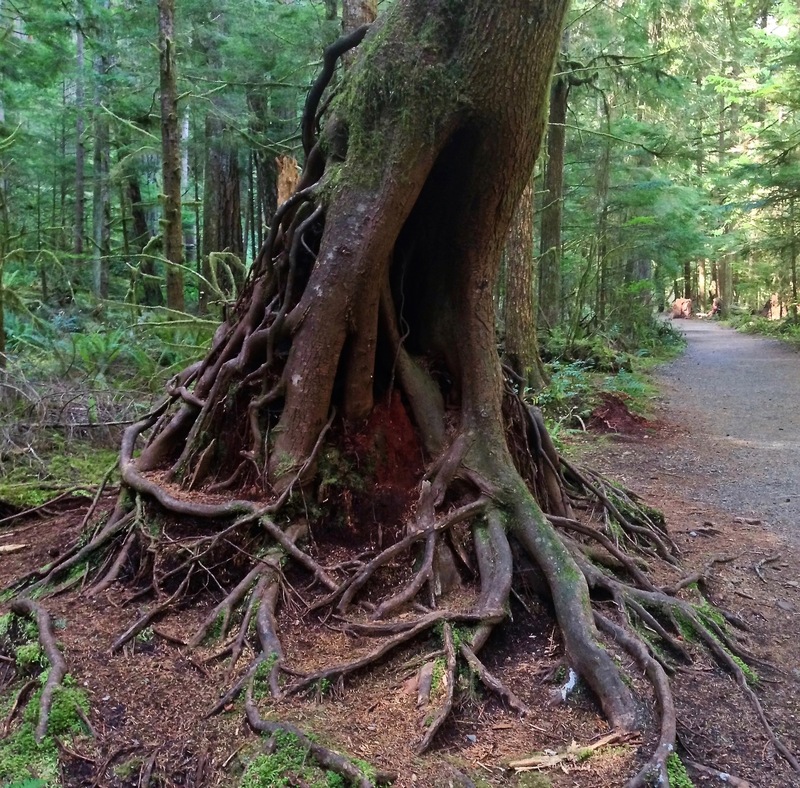 Although linked to other paths on the grounds of Lake Crescent Lodge, the trail officially begins at the trailhead for the Marymere Falls Nature Trail at the Storm King Ranger Station, where a quaint stone tunnel leads beneath Highway 101. Marymere Falls Nature Trail, May 17, 2014. 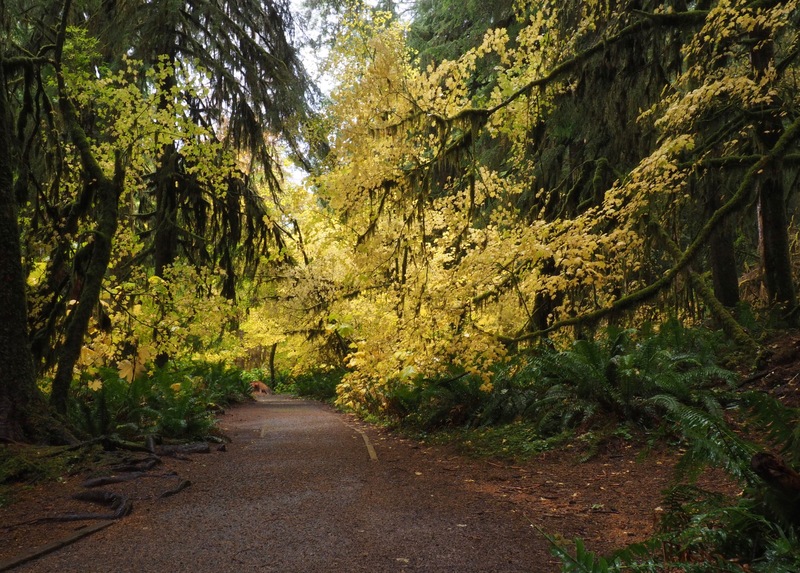 The trail shortly enters evergreen forest and wends through stately woodland colonnades. Marymere Falls Nature Trail, May 17, 2014. In spring, the many-named common, true, water, or marsh forget-me-not (Myosotis scorpioides), a non-native species naturalized from domestic gardens, lines the first stretches of trail with ribbons of blue. Marymere Falls Nature Trail, May 17, 2014. An exposed filigree of serpentine roots fans about the base of a tree sprung from a long-gone stump. Marymere Falls Nature Trail, May 17, 2014. 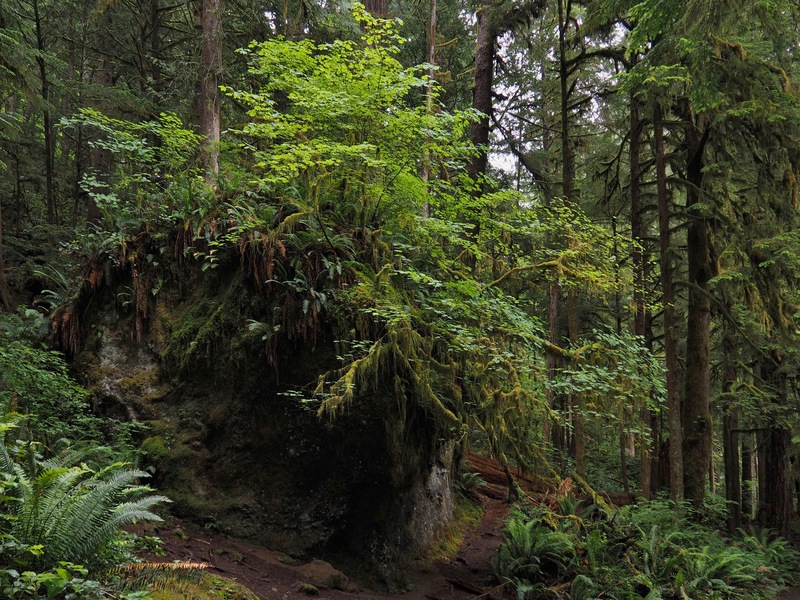 Just beyond the first fork, the trail reaches its junction with the trail up Mount Storm King, marked by a garage-sized boulder hung with mosses, ferns, and vine maples (Acer circinatum). Continue right for Marymere Falls and Barnes Creek. Marymere Falls Nature Trail, June 18, 2016. In autumn, maples festoon the wayside wood with gold. The smaller leaved maples meandering through the forest middlestory, as shown here, are vine maples (Acer circinatum), whereas their much larger leaved and equally brilliant cousins towering above are bigleaf maples (A. macrophyllum). Marymere Falls Nature Trail, October 22, 2017. Its journey nearly done, Barnes Creek rushes along the trail toward its rendezvous with Lake Crescent. Marymere Falls Nature Trail, October 09, 2016. At approximately 0.70 miles/1.10 km from the trailhead, the trail reaches its junction with the Barnes Creek Trail, which forks left and continues up Barnes Creek. To the right, the Marymere Falls Nature Trail leads a short distance to Marymere Falls, where Falls Creek slips near vertically from its clifftop spout, gracefully splitting into lateral cascades at it spills down the rock face. Marymere Falls Nature Trail, May 20, 2017. In spring and summer, diminutive blooms brighten the shadowy woodland here and there. In the top left, American twinflowers (Linnaea borealis) loft characteristically coupled blooms on forked stems. In the lower left, a bank of western bunchberries (Cornus unalaschkensis) bounds the trail. On the right, Smith’s fairy-bells, or, fairy lanterns (Prosartes smithii) festoon the leafy wayside with distinctive triplet blooms. Barnes Creek Trail, May 17, 2014 and June 18, 2016. In spring, keep an eye out for the western fairy slipper (Calypso bulbosa var. occidentalis). With its jaunty coif and gaping maw, this Lilliputian orchid nevertheless presents a striking visage. Elusive and endemic mostly to specific, old-growth woodland habitats, the western fairy slipper is also known as the Hider-of-the-North and takes its scientific name “Calypso” from the Greek word for “the concealer.” In Greek mythology, the nymph Calypso held Odysseus captive for some years before permitting him to continue his journey home. Although the western fairy slipper typically blooms in shades of magenta and lavender, it is not uncommon for it to display its topknot in paler shades approaching white, although its slipper remains spotted. This variation is not to be confused with the albino form of the species, C. bulbosa var. occidentalis f. nivea, in which all parts of the flower are white. Barnes Creek Trail, May 17, 2014. Beyond Marymere Falls, the Barnes Creek Trail continues through fern-floored forest alternating between coniferous and deciduous woods. On the north side of Barnes Creek, the trail appears to end abruptly at a large, tree-topped stone resting mid-creek. Those reaching this point likely missed what appeared to be a side trail that was actually the main trail as it dropped down to the log bridge that crosses the creek before continuing for the rest of its length along the south side. To hikers not wishing to go further or to traverse narrow log bridges, the north trail provides a suitably condensed version of the trial to justify turning back without guilt. Barnes Creek Trail, June 18, 2016. For those who missed the turn for the large log bridge across the creek, not to worry — the bridge itself is much more visible after having passed it and glancing backward. Barnes Creek Trail, May 17, 2014. 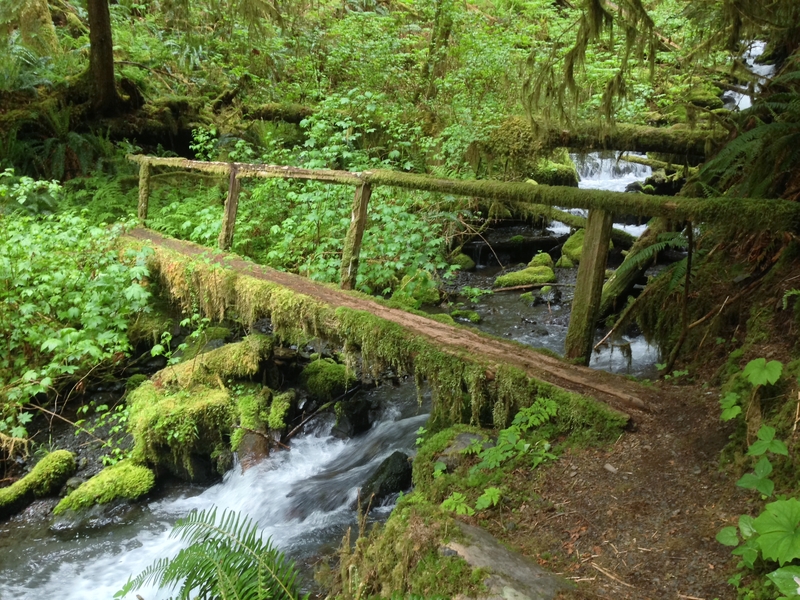 Beyond the log bridge, the trail’s next two miles/3.20 km track Barnes Creek upstream, never venturing far from its sheeted rush, which is often strewn with mossy remnants of titans toppled from its timbered walls. Barnes Creek Trail, May 17, 2014. Here and there, the trail climbs to bird’s-eye views of Barnes Creek, where mossy arms arch aloft its deeply riven valley. Barnes Creek Trail, May 17, 2014. Three more quaint, yet sturdy log bridges carry the trail across tributary streams dashing down the valley wall to join Barnes Creek. Barnes Creek Trail, May 17, 2014. In spring, Pacific trilliums (Trillium ovatum) abound throughout the shady woodland. Distant relatives of garden lilies, trilliums are noted for their triplicate leaves and petals. The pair on the right displays unusually broad, leaf-like sepals (the three green structures just behind the petals), which, as with the trilliums in left photos, are usually much smaller and barely visible behind the petals. Barnes Creek Trail, May 17, 2014. In moist wayside pockets, charm-like blooms of the sorrowfully named the Pacific bleeding heart (Dicentra formosa) dangle from downcast heads. Barnes Creek Trail, May 17, 2014. Throughout the seasons, a variety of fanciful mushrooms and other fungi emerges from the forest litter. Barnes Creek Trail, September 14, 2015 and June 18, 2016. The trail generally continues climbing through dense evergreen forest until its junction at 3.30 miles/5.30 km with the less maintained Upper Barnes Creek Trail, which continues on to the creek’s headwaters, and the Aurora Divide Trail (also known as the Barnes Creek Primitive Trail), which ascends Aurora Ridge to the Aurora Ridge and Aurora Ridge Primitive trails. Barnes Creek Trail, September 14, 2015. The Aurora Divide Trail climbs steeply at first along an unnamed brook, before flattening in a series of long switchbacks up Happy Lake Ridge. Aurora Divide Trail, September 14, 2015. As the trail climbs, fantastical fungi continue to add interest to the autumn wayside. On the top left, a ponderous wood conk hangs heavily from a slender snag. On the lower left, toothy maws, likely those of the scaly vase chanterelle or its kin (Gomphus sp., considered neither actual chanterelles nor edible), yawn from the forest floor. On the right, one of various unrelated species of aptly named coral fungi raises a multitude of fringed, organ pipe-like arms. Barnes Creek Trail and Aurora Divide Trail, September 14, 2015. Where the forest opens near the top of the ridge, avalanche lilies (Erythronium sp.) abound. Here, a long-gone lily’s papery husk cradles the seeds of its next generation. Aurora Divide Trail, September 14, 2015. Occasional windows in the forest open northward to ragged views of Mount Storm King‘s ridge. Aurora Divide Trail, September 14, 2015. 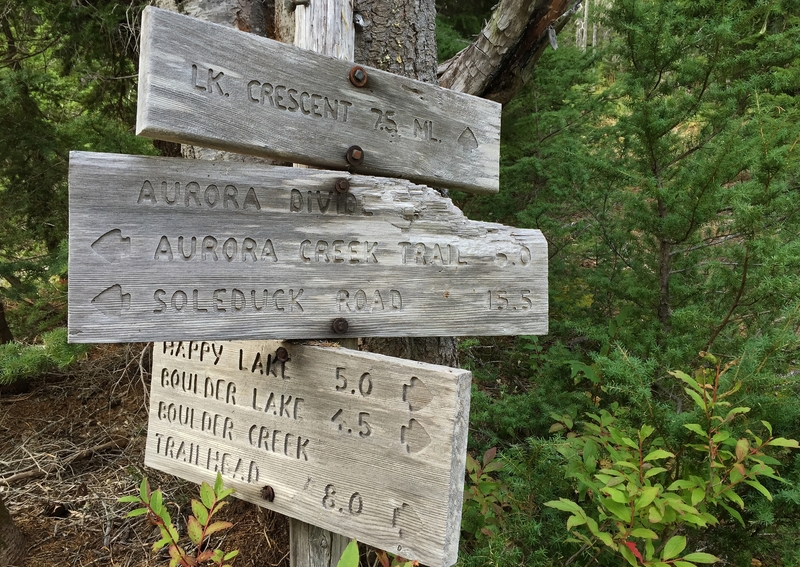 At approximately 7.50 miles/12.00 km from the Marymere Falls trailhead, the Aurora Divide Trail ends at its junction with the Happy Lake Ridge Trail amid scrubby forest typical of local ridgetops. Aurora Divide Trail, September 14, 2015.